Seeing it’s December and all, Mary might just look like she does in this shot, but this picture was taken in our “inner sanctum” a year or two ago, after a big storm. This year, we’re still getting temperatures in the 60’s and it’s not feeling very Christmas-y just yet….although a storm is on the way! Either way, each day begins under her watchful care. For more Virgin A Day offerings, visit Rebecca @ http://corazon.typepad.com/. ~ by Dawn Elliott on December 8, 2012. 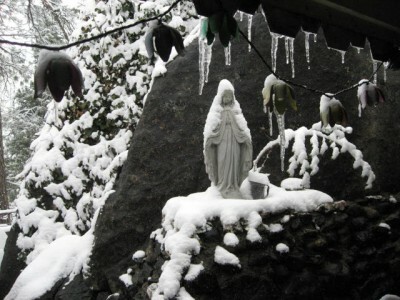 I have a picture of my Mary with a snow cap from last year…yours is so dramatic in B&W with those icicles. 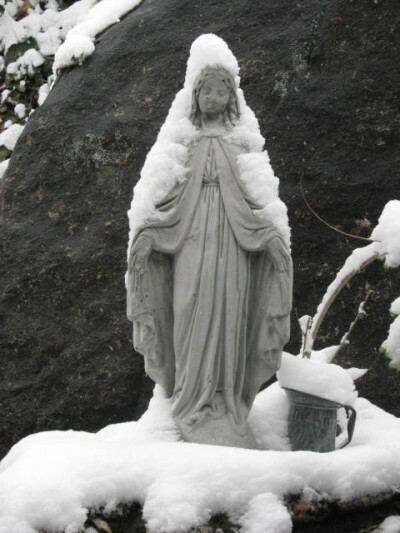 Mary is still there with her arms outstretched, no matter the snow. Love this picture. Thank you. Last year we had next to no rain and this year it is more normal rainfall. Talked to my son today in Indianapolis. I thought for sure they would at least have cold weather and the threat of snow. No such luck. No white Christmas for them. Winters there are feeling very mild according to the locals. This is their first year there. It is strange everywhere. But through it all we have – Mary. an exquisite picture! we never get any snow other than on the very highest tips of mountains and that in June! If that happened in my garden I would be sitting gazing at it for days – so so beautiful – it evokes such feelings of poignancy! I love black and white pictures and these are no exception. Our Lady of the Snow, Madonna della Neve, gets a shout out at my place today.